Not even the brilliant rays from the sun can make this picture appear any warmer around Hudson Bay in Churchill, Manitoba. Dark clouds hanging over the frozen lake are adorned with pinkish hues created in the sunset as the frozen surface of the lake reflects the light. Snow and ice blanket the tundra landscape with small trees along the waterfront that also appear to be cold and frozen. 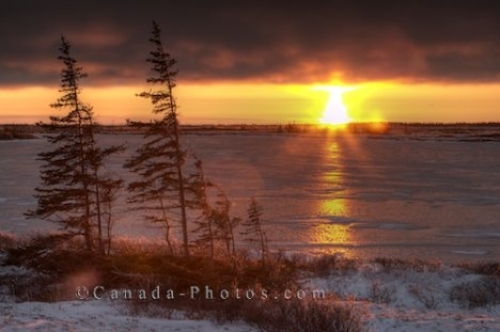 Sunset over a frozen lake on the tundra of Hudson Bay, Churchill, Manitoba, Canada. Picture of the glow across the frozen lake in Churchill, Manitoba as the sunset slowly dips away across the landscape.